RE: looking for ipomoea batatas? Here’s a Man With the Scoop on Sweet Potatoes! 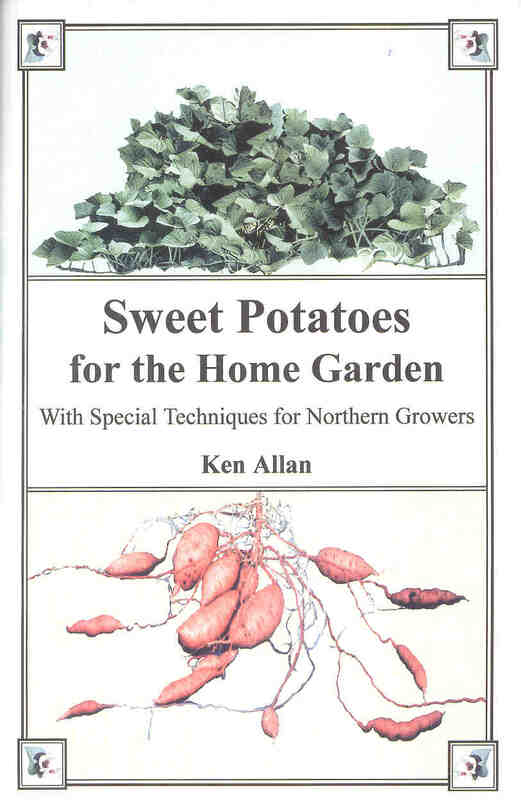 Ken Allan’s book is a ‘must read’ if you’re at all interested in sweet potatoes. By the way, are you aware that it is one of the best vegetables (along with broccoli, walnuts, and cantaloupe) for cancer prevention? My response was “The answer to that is yes and no! Yes, you can try growing them and some gardeners do, but even in a good growing season, the tubers will not develop (ripen) sufficiently so that they may be stored. They must be eaten soon after being dug or they will spoil. Those who grow sweet potatoes (Ipomoea batatas) say they find that they store better in the ground than they do once dug, so dig only what you need and leave the rest in the ground, well mulched so you will have access to them as late as possible in the fall. By the way, dig only after the vine foliage has been killed by frost. That response lead to an informative e-mail from Greg Wingate of Mapple Farm at Weldon, New Brunswick (wingate@nbnet.nb.ca). He is a member of the Organic Crop Improvement Association and to quote from his seed list, “a modest source of seed and plant stock that we grow ourselves well off the beaten track.” Here are the items he grows/sells: Jerusalem artichokes (Helianthus tuberosus), Chinese artichokes (Stachys affinis), Horseradish (Armoracia rusticana), French shallots and Egyptian onions (Allium cepa), uncommon tomato cultivars (Lycopersicum esculentum), Indian tomatillo (Physalis ixocarpa), snow pea shoots (Pisum sativum), Chufa nuts (Cyperus esculentus sativa), and of course, the controversial sweet potatoes, or as Greg prefers to call them, sweetpotatoes (all one word!). “Some vegetables taste the same whether you buy them or grow your own. There are many vegetables, however, that are clearly superior when grown in the home garden. The reasons for this tend to be specific to the vegetable: tomato varieties which are best for flavour are not grown commercially; cantaloupes have to be vine ripened for melting fruity flavour; harvest timing is critical for peas; minimum time from the garden to the table is very important for corn and for new potatoes; and sweet potatoes are mistreated by the retail system. Ken Allan’s book is more-or-less self-published, for which (as a self-publisher) I heartily congratulate him. It is 204 pages in a 21½ x 13½ cm (8½ x 5½”) format. There are a good number of b&w photos, and the front and back covers have colour photos. 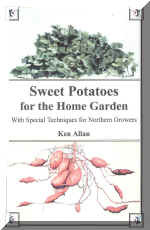 He covers virtually all topics having to do with sweet potatoes including the best varieties, methods of growing (even in cold climates), pests and diseases, propagation (the use of 30 cm [1’] sections of vine which are easily shipped are preferred to the sections of tuber used for Solanum potatoes), growing in containers, curing and storage, recipes, and chilling injury. Ken puts his eight pages of information on chilling injury near the beginning of his book (chapter 4) because he considers the topic one of the most important to lovers of sweet potatoes. He not only gives specific information on how and when chilling injury occurs with sweet potatoes, but also a general discussion. For example, he points out that while sweet potatoes are the most sensitive of all vegetables to chilling injury, bananas and peaches are the fruits most affected. His information on attempting to buy peaches that have not been affected by chilling injury is an interesting treatise on its own. Here is part of his explanation of chilling injury as it applies to sweet potatoes. “Refrigeration is effective for many food items because it slows down biological processes: both those of ripening and of spoilage. With some fruit and vegetables, however, when the temperature drops below 10oC (50oF), the normal processes are changed rather than just slowed down, and the altered biological processes cause damage. … One day in a refrigerator causes drastic irreversible changes in the metabolism of the sweet potato. Even at temperatures as high as 10oC, lengthy exposure will cause chilling injury; to be safe, sweet potatoes should be kept at or above 13oC (55oF). He also notes that amateur gardeners in what he calls “The Tough Zone” also have a modicum of success with sweet potatoes. This zone includes Newfoundland, northern Quebec, northern Ontario, Manitoba, Saskatchewan, Alberta and northern British Columbia. At the time of writing his book he says Marie Coultis of Calgary had a successful crop in just one out of three years, but that she was going to persevere. Though IRT is clear, it does not allow the growth of weeds as does standard clear plastic. Gregg Wingate’s Mapple Farm sells the IRT at $17 for a 1.2 x 15 m (4 x 50’) roll, or $11 for half that length. In his list he quotes a number of growers, including New Brunswick Department of Agriculture vegetable specialist, Andrew Currie, who concluded, “I.R.T. produced the greatest number of Grade A fruit and the greatest total yield.” He goes on to say that production was over 3.5 times the conventional bare ground method. He has similar testimonials from Dorchester (near Ottawa) and Blenheim Ontario, Dartmouth Nova Scotia and Richmond British Columbia. Gregg’s farm may be reached at wingate@nbnet.nb.ca. He also sells Ken Allan’s book at $20 shipping included. You may also reach the author, Ken Allan, at allan@cogeco.ca.